­Dark Hall Mansion, www.DarkHallMansion.com is honored to reveal a piece over a year in the making, our officially licensed Beatles limited edition print, “Pepperland,” by contemporary artist, Marq Spusta, on sale next Tuesday, October 27th, 2015! Dark Hall Mansion, working with Apple Corps Ltd and Bravado International, their North American licensing agent, will release Marq Spusta’s amazing journey into the very heart of the Beatles’ world. 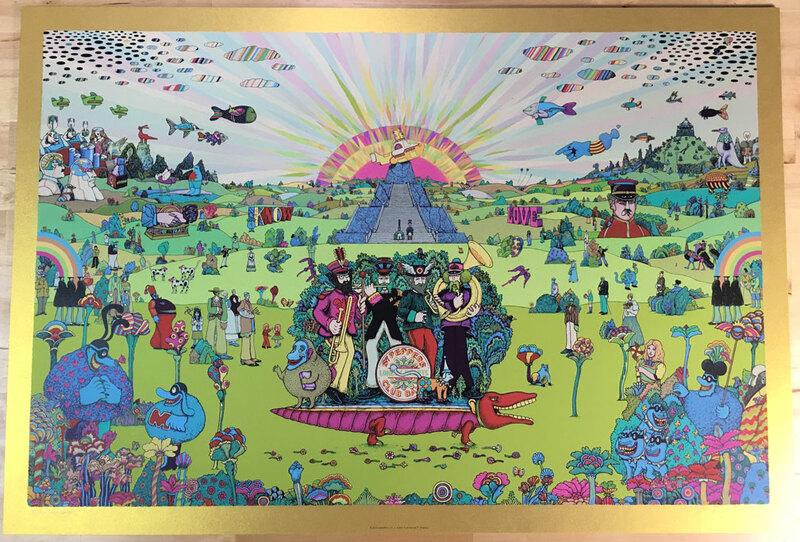 This gorgeous and meticulously illustrated piece has taken artist Marq Spusta over a year to complete on and off, and its tone radiates as much about beauty, art, and love as does the brilliance that is the Beatles’ “Yellow Submarine.” Let your eyes feast on the beautifully detailed minutiae that not only recognizes beloved characters, elements and moments but the creative wonder and beauty that is this masterpiece of a movie. 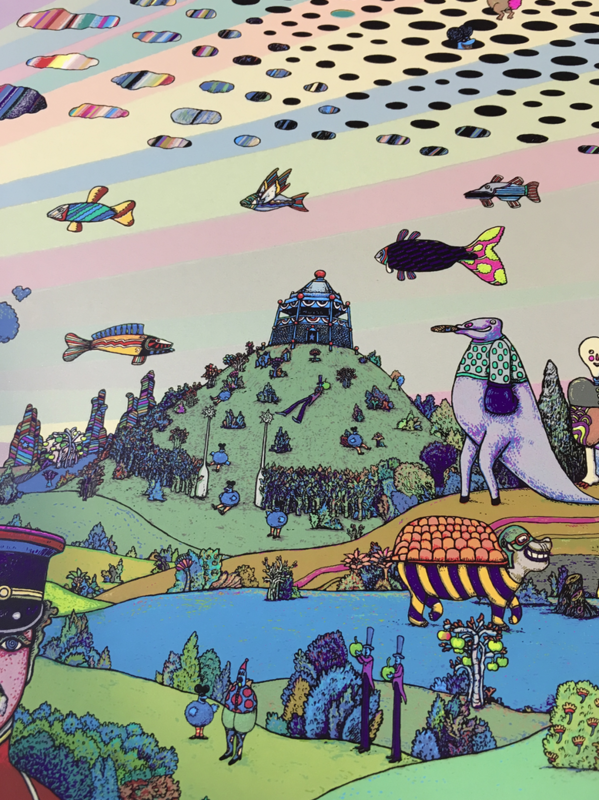 Marq’s lovely composition elegantly brings forth the surreal to reflect on our very real world, and as with the Beatles’ music, we’re all that much better for it. DHM’s officially licensed Beatles Marq Spusta “Pepperland” limited edition Standard print measures 36″ x 24,” Marq’s largest piece ever, is an 10-color screen print, hand numbered, with all editions artist-signed by Marq Spusta himself, and limited to a worldwide run of 455 pieces at $90. 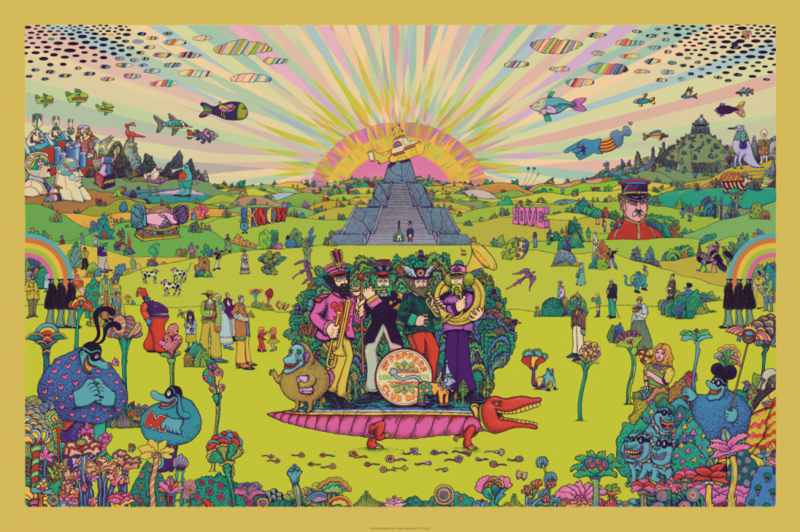 Marq’s Gold Variant edition “Pepperland” is a 36″ x 24″ 10-color screen print on a golden paper stock personally chosen by Marq, hand numbered, and artist-signed, this edition limited to only 150 pieces worldwide at $125. 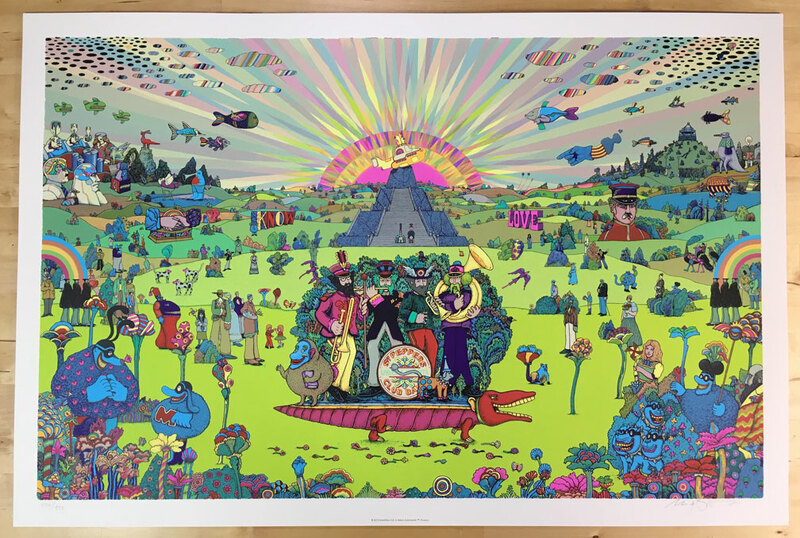 The select Foil edition “Pepperland” measures 36″ x 24,” is a 9-color screen print, on foil stock, also hand numbered and artist-signed, and limited to only 30 editions worldwide at $195. All editions are screen printed, hand numbered, and personally signed by artist Marq Spusta. 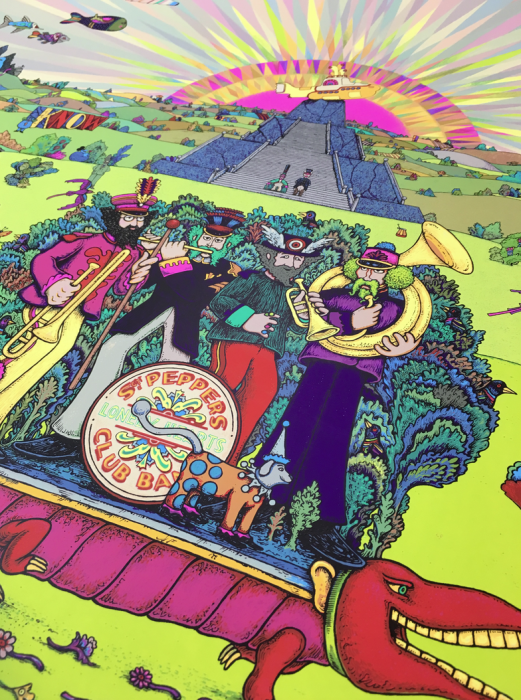 The Spusta Studio Shop will also have copies of “Pepperland” for release in November…stay tuned for further details. perfection in 10 colors! and as it turns out, I’ve got a 24″ x 36″ spot on the wall that needs exactly that many… cheers! Excellent work! Looking forward to trying to snag one! Can you give a rough number how many you will release in November? “Gonna try with a little help from my friends”… to get one of these! Love it, Marq! I love that print. Could you please tell me why the prints are not signed? Thanks. The image here is just a digital comp, the released prints will be signed and numbered. Tried to buy the Standard Edition 2 minutes after it went up on the Dark Hall Mansion store and it said it was already sold out. Disappointed I wasn’t able to get one. Congratulations Marq! 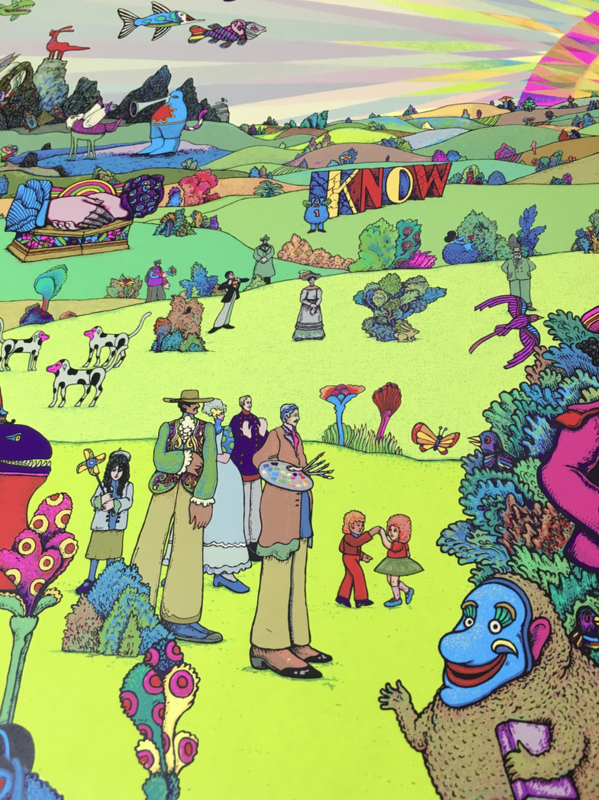 I’m so excited for this print, I grew up on the Beatles! A great print from my favorite movie. Thanks! Same for me. I suspect some bots had a hand in this sale. Already so many are being flipped on eBay. Pretty sad. So many cool little images in the background, any chance some of them might end up on 5×5 7×7 s later? This is terrific on many levels, Marq. I bet you even have a hard time finding some of the hidden treasures (that you placed throughout the piece). I can’t wait to start finding them. So happy I scored one today! Woot Woot! Anything being sold in the shop this week or was this pretty much this weeks drop? Thanks guys and as always keep up the good work! I won one on an e-bay auction this morning! Yes! I had Sgt. Pepper on the stereo as the seconds clicked down, and got the ##/455 standard edition! Worth every penny. My wall awaits it’s delivery. Thanks for sharing your talent with the world, Marq. I was raised on the Beatles! All together now! 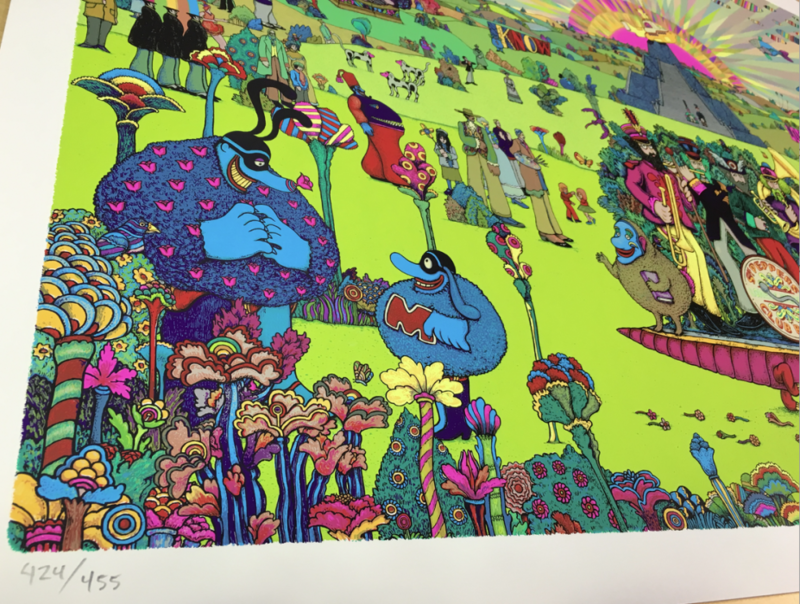 Hey gnomes and marq just wandering if you guys are handling shipping on the pepperland prints or if darkhall is and if they are do you know when they will be mailing them out? Thanks a bunch! COLTON: I got my shipping notice yesterday 11/3/15 from D.H.M. Yay!!! Actually Paragon Press will be handling the shipping for both DHM and Spusta Studio sales of Pepperland. Holding out hope that these still being listed up in the shop might mean that they may become available for a future hump day release?! Many years have passed since my last Spusta purchase but hoping my luck changes soon! Some persons luck is going to change tonight though with the lotto being over 1.4 billion! So sweet. Got lucky got the gold. Heck yeah. Sweet glad you scored of of these beauties and on gold paper as well! Thinking this would look so nice next to “In a World of Pure Imagination” print Marq made! Hoping to obtain one somehow but real sweet you were able to purchase one! Question for you, did you make the purchase for this recently like tonight or was in up in the shop for sale on an off day?